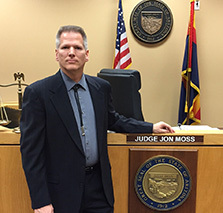 Judge Jon Moss was elected as Justice of the Peace, Bullhead Justice District in November of 2014. Judge Moss was born in Phoenix, Arizona, returning there following service in the United States Army in Armor with the 68th and 77th Armor Regiments and the 10th Cavalry Regiment. He graduated law school in 2001 from Arizona State University's College of Law, a B.S. in Justice Studies from Arizona State University in 1995 and an A.A. in Business from Phoenix College in 1992. Judge Moss lives in Fort Mohave with his wife and daughters, is a proud member of Rotary, and a volunteer coach and referee for American Youth Soccer Organization, region 397. Bullhead City Justice Court Calendar is posted each day at 2:00 pm. Please click here to view current calendar. If you have official court business, check in at the counter before entering the courtroom. The wearing of hats, colors and sunglasses is prohibited in the courtroom. Notice: Cases are subject to being called at the time indicated. Please check in at the Clerk’s window at least 15 minutes prior to the time set for your matter. Directions: The Bullhead City Justice Court is located on Trane Road, between Hancock Road and Marina Blvd, just north of the community swimming pool and east of the county library.